LAWRENCE — The University of Kansas School of Engineering will host a three-day test of engineering skills at the end of April that’s expected to draw more than 400 people from 15 universities in the region. The annual American Society of Civil Engineers Mid-Continent Regional Conference will be in Lawrence April 23-25. The Department of Civil, Environmental and Architectural Engineering is the host organization. 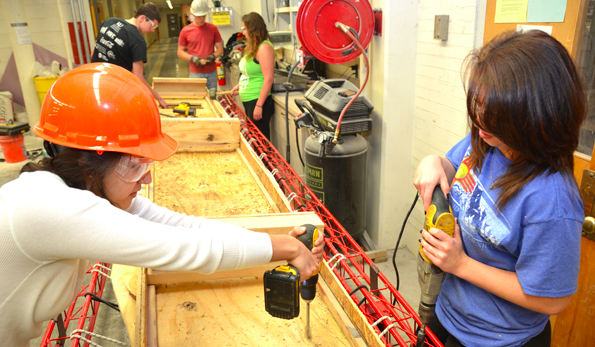 From concrete canoe races and steel bridge design to concrete bowling and geo-wall construction, students on a variety of teams will take part in competitions designed to test engineering acumen. “The conference should be a lot of fun. We’re just hoping for good weather, since so many of the activities are outside. You just never what to expect in Kansas in late April,” said Julia Dury, a junior in civil engineering and conference organizer. Dury has been busy finalizing the details of the conference. Her duties include fielding emails about rules and regulations and finding people in industry to serve as judges for the various competitions. With the Kansas City area serving as a hub for outstanding engineering firms large and small, Dury said KU is fortunate to have so many resources nearby. “We’ve assembled a great panel of judges, many of them dedicated KU School of Engineering alumni, and we’re grateful to them for lending their time and expertise to the competition,” Dury said. The steel bridge competition will take place April 24 at the Lied Center. Concrete canoe, concrete bowling and the geowall competition will take place at Lone Star Lake, 10 miles southwest of Lawrence, on April 25. The conference also includes various presentations and project displays, a social event Friday night at South Park in Downtown Lawrence, and it concludes with an awards banquet Saturday night. A full schedule is available here.